Like most members of the Nerdy Book Club, I first heard about Wonder on Twitter. I'm fairly certain either Paul W. Hankins or Mr. Schu (probably both) were singing its praises. 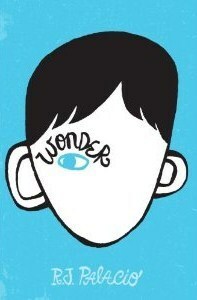 I first read Wonder by R.J. Palacio in February of this year. I tried to purchase it right after the February 14 release date, but Barnes and Noble didn't have any in stock yet. (I was appalled! Didn't they know what an amazing book this was supposed to be?!) I immediately went home and tried to download an ARC from NetGalley. Luckily, I was approved and was able to read it less than a week after it was released. Simply put, I fell in love. After reading Wonder, I immediately ordered copies for my school library. I introduced it to one of the 6th grade reading classes during library time. They sat and listened to me, seemingly spellbound by the story. I knew it would be a great read-aloud for their teacher to continue. (As our student council sponsor, she runs all kinds of great anti-bullying awareness activities and has a real heart for students.) The teacher continued reading the story daily to her class and allowed me the privilege of reading bits during library time each week. The class continued to come to me and tell me how much they were enjoying the story and view points. I spent a full period reading to the class when the teacher was absent and had to read about...you guessed it...Daisy dying. Tears were shed by the students, by me,...we all had to just take a few minutes to absorb the loss, reflect on our own losses, and console each other. It was a moment I will never forget. I tweeted to R.J. Palacio and was able to arrange a Skype visit with her and this class of 6th graders for our last day of school! We had never had an author visit via Skype. Students prepared questions and we had an amazing visit with her, talking about the story and the impact it had on all of us. We knew that reading Wonder would be a wonderful way to begin the school year. I gave all three 6th grade teachers a copy of the book to begin as a read aloud on THE FIRST DAY OF SCHOOL. We felt it was a great way to set the classroom climate. 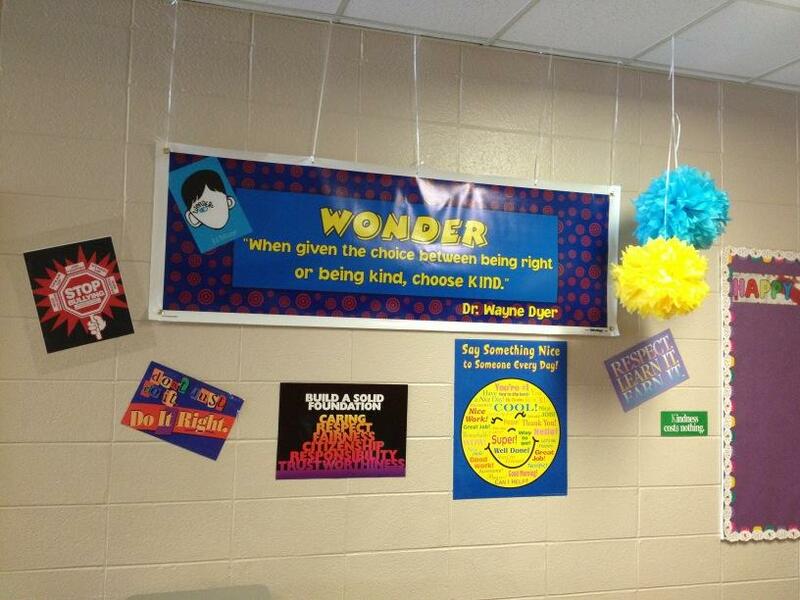 The 6th grade hallway was adorned with a huge banner and posters that illustrated the message of Wonder. The classes are now almost finished with the book. We've had discussions in the library, connecting Wonder to The Dot, discussing the power of choosing kind, making our mark in a positive way at school, at home, and in our community, and the ripple effect of our actions. Teachers will each be given a post-it note packet as well to further promote the positive messages. There will be daily announcements during the week about "choosing kind". On Wednesday, October 10, I will host a birthday party in the library for Auggie for all of the 6th graders. We'll have cake (of course! ), sign the pledge at the Choose Kind Tumblr, and make a lengthy list of all the ways we plan to choose kind in the days ahead at our school and in our individual lives. 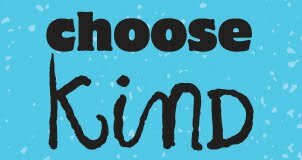 During the following weeks, I hope to make some Skype connections with other classrooms, sharing our "choose kind" stories. I'm also working on a student project with David Etkin (founder of #WonderSchools) which he will reveal in an upcoming blog post! That 6th grade teacher at my school who's been instrumental in all of these plans? She's taken it even further to the Indiana Association of Student Councils, making Choose Kind their theme for this school year and hopefully (fingers crossed!) 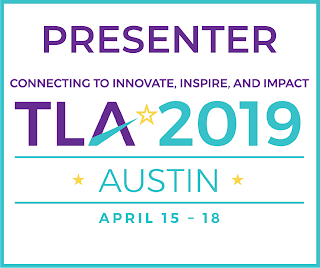 bringing author R.J. Palacio to their ML Spring Conference for students! I would, of course, love to have R.J. Palacio visit our school either via skype or in person this school year (details still in the works). Above all, I will continue to do my best to daily "Choose Kind" and be an example for students and staff. Wonderful post, Sherry! Thanks for sharing! You are doing amazing things at your school. They are lucky to have you. Thanks so much! I remind myself daily how lucky I am to have a job I love and enjoy. Wow! Awesome! I'm reading Wonder as a read aloud, and I LOVE your idea of celebrating Auggie's birthday on Aug. 10th!!!! :-) I also love the bracelets! Thank you for your great ideas! Liked the beautiful message conveyed in this book. Thanks for sharing that you enjoyed the flow of the multiple POVs.